Last week I was lucky to be able to get a review copy of Inside the Creative Studio from Interweave. Let me tell you, this is a book you want. I dropped EVERYTHING once I cracked it open. This book is so full of inspirational eye candy it’s amazing. So many different artists opened up their studios for photos and floor plans and interviews. I read about everything from tiny closet studios to whole barn studios. And yes, I did mention floor plans. Every studio featured showed the floor plan as well. To this former interior design student, it made my heart sing. Photos of the space are one thing, but to see how the arrangement actually works is another. The book is also chock full of tips and information. Storage tips (including thinking outside the box on what you can use to hold the bits and baubles of a crafting life), lighting tips, color scheme tips, etc. I read this book in two sittings, and will likely read it over a few more times. This is a great book, whether you’re a full time crafter or just looking for a space for your creative hobbies. Any type of crafter can find inspiration in this book. Even for non-crafting things. I’m already getting ideas to help with redesigning an office space. I’m getting other ideas, too, for when I ultimately move out of this space. This book is good for that, to sit and plan and dream of what is possible. As many of my long time readers know, I’ve had a lot of incarnations on studio space. I started out with a whole bedroom to myself for my studio and now I’m squeezing studio space into a 225 square foot room (with my bedroom and living area). And even that space has changed since I moved here over a year ago. And how it then moved to this, slightly less chaotic spot? Added to that since has been the addition of my bulletin board for inspiration space to the left of the table/desk on the wall. And yes, that’s the bulk of my stash (save for sock yarn which lives in its own container) under the table. 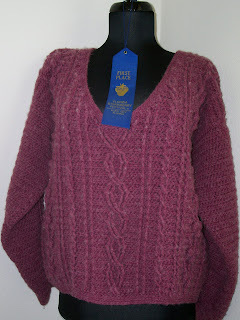 Speaking of stash, Interweave is having a huge contest. Here’s the details! Put this book on your wish list! You’ll be happy you did! 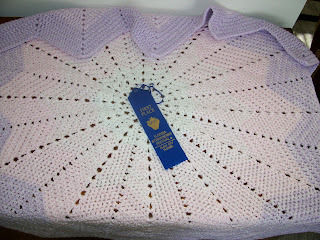 Win a Fabulous Crochet Gift Basket! 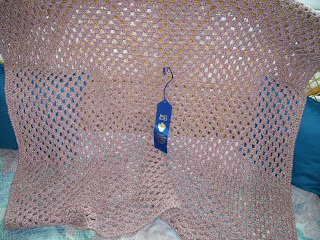 In honor of National Crochet Month 2011, Fibers By Tracie is partnering with Crochetville and a number of indie designers, spinners, dyers, and hook and toolmakers for the Crochetville NatCroMo 2011 Treasure Hunt. Each indie business has donated one or more special items for a super-special crochet gift basket that will be presented to one lucky winner by March 31. Contest participants will have to find the logo on each indie business’s website. Entry forms may be submitted from March 8 through 11:59 PM CST March 25, 2011. Participating businesses will hide the logo on their site by March 8, so please don’t begin searching until the evening of March 8. 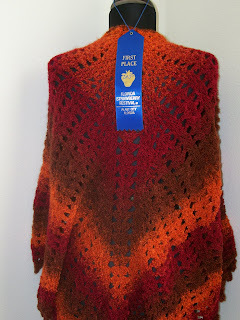 Click here to visit the Crochetville site for complete contest details and an entry form! Now, I’m gonna tell you a secret…you’re not going to find the logo on my website. 🙂 Part of that is because I need to move the site and haven’t made changes to it in a while over on the current server. But, if you go to my sidebar (which means if you’re reading this on a reader, you need to click through to the actual blog), you’ll find an interesting little link where you might maybe find the treasure photo. Just saying. 😉 I can’t give it away, y’all gotta work for it. But do check out everyone’s websites! I’ll have another post later this week (maybe, unless I hold it for next week) to announce a few other patterns of mine that have come out. Until then, have a fabulous week everyone! Congrats to the Drawing Winner! Thank you for everyone who entered my first giveaway here on the blog! If you didn’t go back to read the entries, you should. There’s some great resolutions out there! Hmmm, let’s see…..I’ve got a HUGE stash of yarn and I really would like to get rid of it! I’m thinking baby hats, because they’re so quick. Plus, the more I make, the more I get to donate. I would also like to organize all these pieces of paper containing all these patterns I just HAD to print out. I guess I’m just a tactic, visual person because, even though I have them saved in the computer, I love having them printed out to look through from time to time. That’s probably enough for now. Congrats Leslie!!!! Please email me at fibersbytracie at gmail dot com! I hope to do some more drawings throughout the year, but a lot will depend on what I have to give away. Please stay tuned! In other news, keep an eye out. 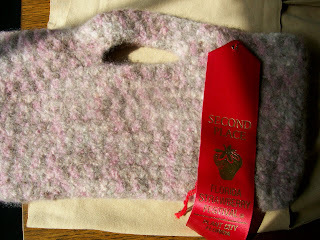 One of my resolutions is to put out new patterns in the Fibers By Tracie line on a regular basis. This month’s pattern may be a quick one but appropriate for this weather! Speaking of weather, I’m not sure if everyone is paying attention, but it is currently colder in Florida than it is in Washington (thanks to Fearless Leader aka Laurie Wheeler letting me know that). Gah! 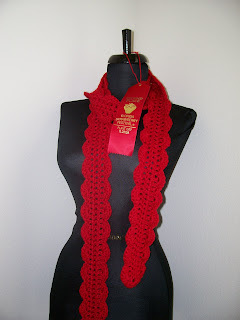 I’ll be crocheting to stay warm this weekend as we are on snow watch here! I’m home, I’m exhausted, and I have a nice case of what is affectionately called “Con Crud” (comes from picking up new and interesting germs from people attending conventions). Update will come later. I don’t have all my pictures (Margarita took a lot more than me) so once I get them all together, I’ll update. I will say, that even considering how I’m feeling right now, the trip was totally worth it. I met a lot of great people that I’ve been corresponding with for a while now, I made a lot of great business contacts, and I learned a lot that will help my designing career take off. Main page: Added my award, updated my status with CGOA, updated relationship status (since we’re engaged), and added a listing of my published designs. Lessons: Just needed to clean up how that one was written. Over the last few updates I’ve been just deleting stuff that wasn’t valid and never really went about actually editing it. So I did. It reads a lot cleaner now. Pattern pages: Learned something new last week. Text in tables is not searchable by search engines. Who knew? Well, someone other than me until last week. So I went through and put in links (which also help take you right to the pattern you’re looking for instead of scrolling down through a long page) which ARE searchable. 🙂 I also updated my links to Ravelry to make sure those were all correct. With the website done (and all changes uploaded and checked), I headed into the studio. I’ve been working on one idea for the Design Contest. But I’m not thrilled with it. I’m happy with it, but I just don’t see it as being a contender at all. So last night as I tried to get to sleep, my brain kept turning around my other idea. This morning I started working on it. I think it’s going to be a better contender. I might still send both in, or I’ll redo the first one for a child (hey, smaller, less crocheting) and submit to two categories. Now I’m waiting on John to decide what we’re doing for lunch. Then it’ll be back to work on that. Have a good weekend if I don’t post before then! Ah, the joys of designing. The first part of the project I’m working on for a call is fine. It’s done, it looks good, I’m excited about it. Today I was working on the finishing bit (this would be so much easier to just show you, but nope) and after working for about 2 hours on it I realized it wouldn’t work. So I ripped it back. Now I’ve got another direction and I think it’ll be even better. For the most part that’s how my day has been spent. Well, in between coughing fits. I hate coughing. I am feeling better, though, so I guess that’s a good thing. I also went around the house and started spraying Lysol. John comes home tomorrow and I really don’t want to get him sick. Tomorrow I’ll wash the sheets, spray down the bedroom and bathroom, and vacuum. The Florida State Fair is coming. I always forget about the deadline for entering into the competition until it’s too late. This year I remembered. And now my entry form is filled out (only 3 items this year…I’m trying to decide on a possible 4th) and ready to mail out. Then I’ll go in a few weeks and drop off my items. John told me last night that the camera he got me is purple! 🙂 Yay! It’s tiny, though. He said it’s definitely a “chick” camera because it’s too tiny for his big “man hands” (his words, not mine). He’s already charged it for me so it’ll be ready to go on Saturday when we go to Disney with the family. Okay, that’s all from me. I’m going to go get back to work and see if I can finish this today. So, there you go! I was very pleased with how this turned out. 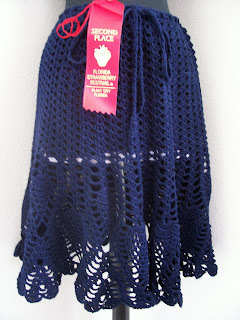 🙂 The blue skirt had a note about it needing a lining (nevermind I wear it with an underskirt) so I wonder if that’s why it only netted a 2nd place. Oh well, I’m still okay with it. Texture: This has a subtle texture due to the Back Loop stitching. Drape: It has good drape in WW with a J hook. Drape could easily be adjusted with yarn and hook size choices. 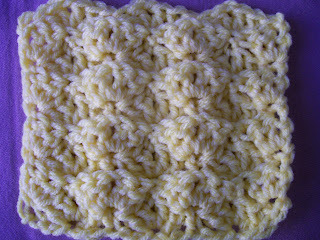 Opacity: This is a rather opaque stitch. Comments / Thoughts: I like this variation on shells. It is a really neat stitch and I like the texture from it. In other news, I’ve finally shook my lack of motivation with crochet. I’m working on a submission piece. I have another one I want to work on after this. I feel good about them both. I wish I could show you, but on the one I’m working on now, even an extreme closeup would be too easy to figure out. And showing pics is a big no no in the publishing world. Even Ravelry is a dangerous place to show things in the works (if it’s a submission piece) because while it’s still invite only, there are a lot of people in the publication world on there. So that’s why there’s always fun pics in my spots for submission pieces. 🙂 It allows me to put a spot in there if I need to keep track of things, but keeps things top secret. My new plan is to wait until it’s published and then enter the info. 🙂 Now that I’m way more organized it’s easier to just keep the details in the pattern itself. 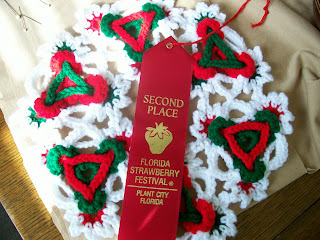 Today I go to pick up my items from the Strawberry Festival. I’m still waiting on pics from Kerry of my stuff up in the display. 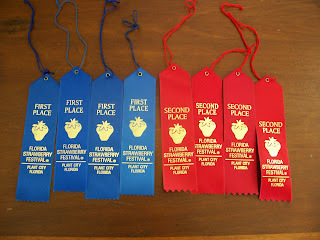 When I get home I will take pics of the items with my ribbons. I’ve started on a sweater for a former coworker. I’m using a pre-published pattern so I have time to just relax and not have to work and do math. 🙂 It’s a hoodie pattern from Bernat. I like it. I’m making it in Softee Baby which I love.